Of course, famous actor + UFO = major media attention and as we speak, Crowe's "117 character (with spaces) tweet" is reverberating around the world. Admittedly, I was perplexed by his publication of the images . 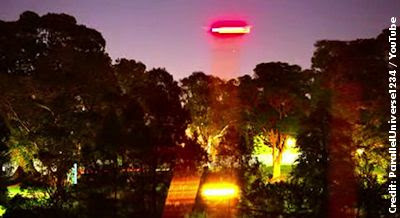 . . not because it was Russell Crowe himself, who was bringing UFO related evidence to the table, but rather that a man who has so much on his plate can get board enough to post time-lapsed shots off his balcony and posit the one word question "UFO?" I can't help but think that a bull-session with his mates and consumption of large quantities of Foster's might have precipitated the tweet and link to the YouTube video showing the time-lapsed stills (see above). ". . . Russ's place is near the end of the wharf, the shot is taken looking west towards the botanic gardens﻿ and Mrs Macquarie's Rd. In the video you see 2 cars drive along Mrs Macquaries Rd, keeping in mind it's a time lapse shot with the shutter open for a number of seconds. The 'UFO' lights are a yacht passing in the foreground... there are lots of millionaires yachts moored there. . . ."
Of course this will matter not to some ideologues, and Crowe will still be chuckling, reaching for another can . . ..